Today, my card features Dashing Santa Claus from Make It Crafty! These new Steampunk Santas are so creative and fun. They work so perfectly with Tim Holtz products, giving that old-fashioned shabby look. Unfortunately, the photography did not catch all the background colors. I used very light yellows, blues and grays to give the sleigh movement. The Tim Holtz Pinecone Die is so versatile. I tend to make nice vintage flowers with this die. It's time for another 7 Kids College Fund Challenge. Our challenge this week is Thankful! I am hooked on these adorable Saturated Canary images, available at 7 Kids College Fund! They are really fun to color. I love the details and gorgeous eyes.I colored Wendy with Copics, using R20, R22, R24 and R27 for the dress and bow, and YG13 and YG17 for the puppy's bow and her eyes. 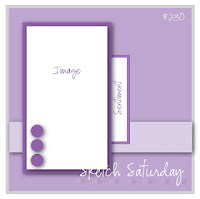 I used the sketch from Sketch Saturday and will be entering this card in their challenge. Today, I have a card for you using Tilda with Blue Blanket which you can find at 7 Kids College Fund. I am entering this card in the CLP Challenge. Thanks so much for stopping by today. Check back tomorrow for my 7 Kids College Fund Challenge creation. Today, I am showing off one of these incredible images from Make It Crafty. It is from the new Santa Steampunk Collection. This Santa is called Christmas Eve Countdown. As soon as I saw these Santa digis, I thought they would be great with Tim Holtz products. The paper, reindeer and flower are all from Tim Holtz collections. Go check out the new Santa Steampunk collection! This stamp is not currently available, but there are tons of Magnolia's available at 7 Kids College Fund! I colored this cutie with distress inks (Pumice Stone and Rusty Hinge).